Imperial Assault Skirmish Maps have seen you travel the Star Wars™ galaxy, from the palace of the vile Jabba the Hutt, to the forgotten junk piles of Coruscant, to Nelvaanian warzones. Now it’s time to take the fight to Tatooine’s most famous hive of scum and villainy. Fantasy Flight Games is proud to present the Mos Eisley Back Alleys Skirmish Map for Imperial Assault, available now from from your local retailer! Included with the playmat are the two mission cards corresponding to this skirmish map, introducing your objectives and inviting you to focus on the valuable crates that can be found in Mos Eisley. One scenario sees players vying for control of crates as more and more doors become unlocked. The second sees figures retrieving crates and delivering them to your private stash for points. In the Mos Eisley Back Alleys, making a profit is just as important as winning the battle. 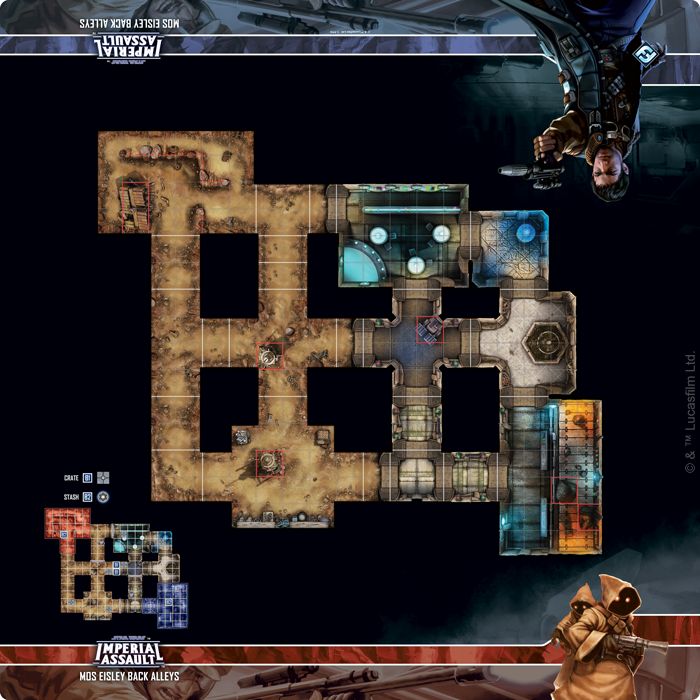 Protect your figures with this slip-resistant map, and dive into the seedy underworld with the Mos Eisley Back Alleys Skirmish Map for Imperial Assault. Dive into the shady streets of Tatooine and purchase the Mos Eisley Back Alleys Skirmish Map (SWI52) from your local retailer!